We have the perfect gift for your family and friends. - Texas Pecan Pie - Our Texas Pecan Pie is superb, loaded with pecans and only the freshest ingredients. - Butterfinger Pecan Pie. Our famous pecan pie recipe with pieces of our favorite candy bar. This product suggestion came from one of our customers a few years ago and folks have been loving it ever since! - Bourbon Pecan Pie is the newest addition to our family of pies. The flavor of bourbon makes this pie a favorite of sweet lovers everywhere! We prefer ours served warm with a nice hot cup of Pecan Coffee. - Chocolate Pecan Pie. Why would we want to mess with the perfection of our original pecan pie? Only to make it better with the addition of chocolate! Serve warm with ice cream and enjoy. - Pumpkin Pecan Pie. For those who love our classic pecan pie and good old fashioned pumpkin pie, this is the best of both worlds. 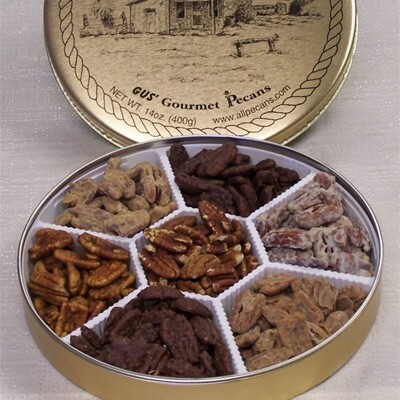 The creamy, smooth texture of the filling is combined with the wonderful taste of pumpkin and topped with pecan pieces. Yummy! Is all that I can say. Tasted just like my grandmother's. We will definitely order another next year. The pie filling was great!m and took right back to Kerrville at Grandma's house. The crust however was disappointing, it was almost like I'd was stale and hard, not flaky at all. The altitude in Denver may have something to with this as well. I may try a pie again if we ever move to a lower elevation. The pie was a gift for my elderly father who had never had pecan pie before. He really seemed to like it. Well, he ate it all himsef and none went to the neighbors so I'm thinking he liked it. Pie was unfortunately delivered kinda smashed up. It was a Fathers Day gift too. We still ate it but was disappointed.